After a hard day of work and on the way home, my wife and I felt we needed a well deserved rest. We usually walk along Colmore Row (in the heart of the Colmore Business District’s wide range of eateries, more to review!). But for a change we cut across the cathedral square and had a mosey on down Waterloo Street. ‘d already had a large lunch and found my appetite somewhat lacking. However, my wife hadn’t had a thing since midday and was on the verge of taking a bite out of the tasteful decor. 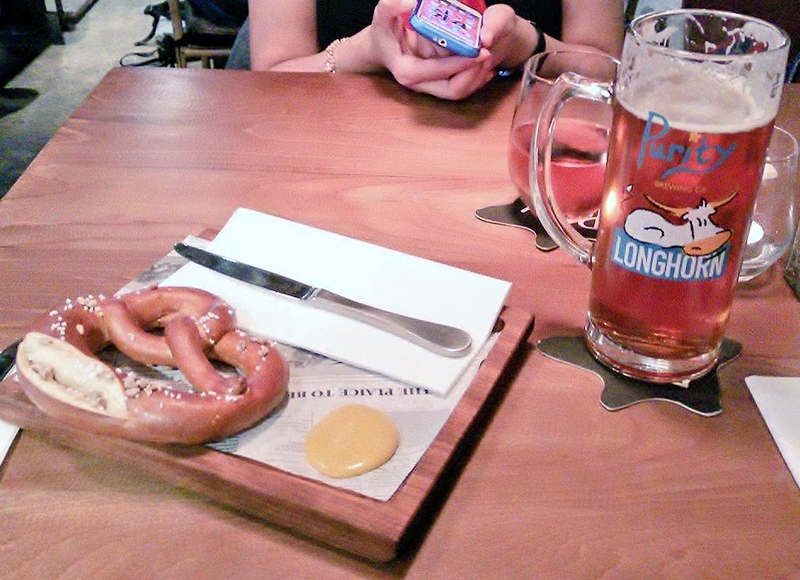 Whilst at the bar ordering my almost obligatory Longhorn (IPA’s are my achilles heel) and a nice glass of rosé for my wife, I ordered a pretzel. To give us something to chew over whilst looking through the menu. The pretzel was good, well salted with just about the right amount of sesame seeds. Paired with a powerful and punchy English mustard, which sent tendrils of rich, intense aroma through the nose before taking a bite. It was too strong for my wife, who had to have a large glug of wine to remove the taste! I found it just about right for myself. A short time after, the waitress arrived and took our order. I went for something I’d ordered before and enjoyed from the snack menu, the scotch egg. My wife plumped for the day’s special; a fish finger sandwich and chips, accompanied by a half of guest IPA (which I promptly took off her hands). What can I say about my scotch egg except it’s the best scotch egg I’ve ever tried. The albumen is solid, paired with a gooey yolk. It’s balanced with sweet, moist sausage-meat and crisp breadcrumbs, served with a sharp tangy ketchup hidden under the egg which rounded it off well. The crisp shards were almost enough to stop me stealing the wife’s chips… …almost. But enough about my egg. My wife’s fish finger sandwich was a MONSTER, the fingers could pass as a mini fish on their own in most chippys! The bread was soft with a sweet malty flavour, tempered by the floured edge. It was that big my wife found it difficult to eat with her small hands. When she ate it, she found the fish was delicate with a well cooked flavour, surrounded by a light and crispy batter overlaid with rocket. The tartar sauce was a little heavy on the capers for the one bite I managed to steal before my wife polished it off, but she was more than satisfied with it. There was only one minor downside. The chips were over-salted and could have done with another minute in the fryer to keep a bit more crispness. This may have been down to the heat leaking from the enamel mug. The chips had got a little limp by the time my fingers began fishing around the bottom. All in all, it was a great after work meal and I’d be happy to return any day of the week. If you’re out and about for craft beer, great food in a nice relaxed location in Brum, I’d recommend popping along to Pure for a snack and a chilled pint.